We recently published the third Death Certification Review Service annual report. The report highlights that, since the Death Certification Review Service was established as part of Healthcare Improvement Scotland in 2015, there has been a significant reduction in errors made by doctors in the information they complete when someone dies. In fact, accuracy errors by certifying doctors have reduced by more than a third ­– 37% to be precise – since the service was introduced to help improve the quality and accuracy of Medical Certificates of Cause of Death (MCCD). An MCCD is the form that must be completed by a certifying doctor when someone dies in Scotland. The MCCD provides a permanent legal record of the death, records information about the death (including the cause of death) and allows the death to be registered. The Death Certification Review Service checks the quality and accuracy of MCCDS in order to improve the way that information about deaths is recorded. We review approximately 10% of all deaths, with MCCDs randomly selected for review by an algorithm developed by National Records of Scotland. Some deaths require to be reported to the Procurator Fiscal and are therefore not reviewed by the service. Reviews of MCCDs are carried out by medical reviewers, all of whom are trained and experienced doctors both from a general practice and secondary care background. The review process enables the medical reviewer to speak to the certifying doctor about the certificate and case history. The purpose of the review is to determine if the MCCD completion is in order rather than look at the quality of care provided to the deceased prior to their death. In 2017-2018, the Death Certification Review Service found that 27.6% of MCCDs reviewed were ‘not in order’. This compares to figures for 2015-2016 when 43.9% of MCCDs reviewed were found to be ‘not in order’. The overall improvement between 2015 and 2018 represents a 37% reduction in ‘not in order’ cases. Of those MCCDs found to be ‘not in order’ in 2017-2018, 93% had minor errors such as a spelling mistake, lack of specific detail or missing contributory information in the second part of the certificate. Only 7% of MCCDs had major errors such as omission of hazards, e.g. pacemakers, or an incorrect cause of death and required a replacement MCCD to be produced. It’s very pleasing to see that the Death Certification Review Service is having such a positive impact on improving the accuracy of MCCDs in Scotland. While the vast majority of errors that we see in MCCDs are minor, it is nevertheless important that we continue to drive improvements as bereaved families want to be assured that all of the information relating to the death of their loved one is as accurate as possible. Improving the quality and accuracy of MCCDs will also lead to better public health information and contribute to safer clinical practice. We saw a good example of this last winter we used our data to identify an upsurge in winter deaths and requested a temporary suspension of the requirement to automatically report deaths from influenza to the Procurator Fiscal. This removed a layer of administration and helped to alleviate pressure on medical staff during the peak winter period. This was the focus of my previous blog, from March 2018. In addition to carrying out reviews, the Death Certification Review Service has also developed a number of educational tools to support improvement including producing guidance for certifying doctors and developing eLearning modules in collaboration with NHS Education for Scotland. The service continues to work successfully in collaboration with our partner organisations: National Records of Scotland, NHS24, National Services Scotland and NHS Education for Scotland, in addition to wider stakeholders, and public partners. Together we have helped improve the quality and accuracy of MCCDs across Scotland and our focus continues to be to ensure that these quality improvements have minimal adverse impact on the families of those bereaved. George Fernie is Senior Medical Reviewer with the Death Certification Review Service. 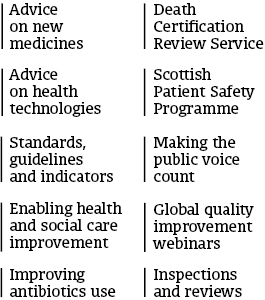 Click here to access Healthcare Improvement Scotland’s Death Certification Review Service Annual Report 2017-2018.